Six riders set off from Rippleside Park for a 55km northern circuit – Karen, Kelly, Ric, David F, John M and Helen (ride leader). 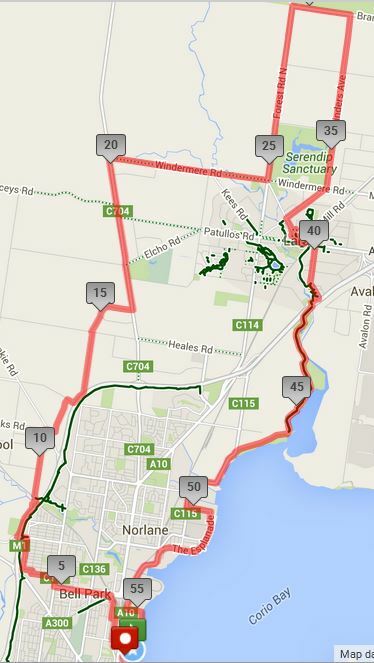 After wending their way through the streets of North Geelong, and a sharp uphill along Neill Street Hamlyn Heights, the ride continued along Bluestone Bridge Road (formerly Rollins Road) to Lovely Banks Road. The ride to the You Yangs went through new estates in Lovely Banks to Bacchus Marsh Road, then along Windermere and Forest Roads. The riders kindly waited for Helen back at Windermere Road after the swift downhill tailwind along Flinders Avenue. Coffee was at Cafe Xpresso in Lara. Rosemary joined the riders for coffee here, accompanied by her cute pooch – after a morning browsing at a local school fete. The riders returned via the Hovells Creek path and the waterfront. Thanks to everyone for a most enjoyable morning’s ride. This entry was posted in Ride reports and tagged Cafe Xpresso by hlyth2013. Bookmark the permalink.